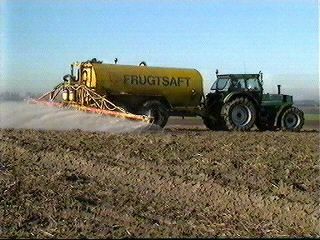 Field test of juice as a fertilizer. Small harvester suitable in size for the plots - each plot just a few metres wide. The flexible tube is wound round a drum slowly pulled home before the system is moved. Alternative alu-pipes are used. 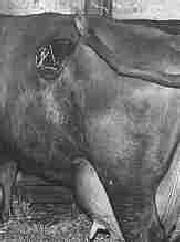 The Protein Balance in the Rumen (PBR) is -85 g per kg pulp dry matter. The figure is negative because potato pulp requires nitrogen for its digestion in the rumen. Potato pulp is improving the microbial activity in the rumen. Calculated on dry matter the feeding value is equivalent to barley. The high digestibility of the fibre content makes potato pulp of particular advantage as a roughage to high yielding dairy cattle. Once the non-starch constituents of starchy raw materials were considered a waste. These days are over. Now all constituents are valuable. Landspreading as a fertilizer. The solubles used to be disposed of by land spreading. In cooperation with the Ministry of Environment, Agricultural Institutions and the Danish starch industry we carried out long-term field tests to establish the fertilizer value of potato juice. Over a three year period we distributed undiluted potato juice to 128 test plots at different time of the year and on different crops. 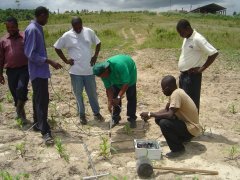 More than 10.000 samples were drawn from the soil below the root zone of the plants and analyzed for their nitrogen content and some for a full mineral assay. The result was clear. Juice is as valuable as artificial fertilizers when applied correct in time and quantity. Read the full story about the field tests. 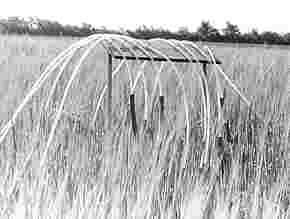 Later similar tests were carried out in the tropics. These tests made it possible to draw upon our vast knowledge base and adapt it to a different climate and a different crop. The result was just as clear. The juice from cassava tubers is as valuable as artificial fertilizer when applied correct in time and quantity. With increasing energy prices it becomes feasible to turn the organic constituents into energy before disposing of the juice as a fertilizer. The plants anyway prefer minerals and the organic part does only act as a soil improver. For potato juice it is of particular interest to precipitate its genuine protein. The price of protein has went up and up and now starch and protein contribute more or less equally to the overall factory economy. Anaerobic biogas digestion. The residual precipitated juice is concentrated by evaporation and sold as a fertilizer to farmers appreciating its long-term effect and its high potassium content. 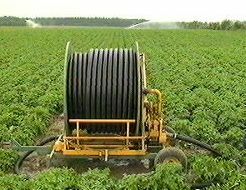 A few companies precipitate the potassium by further evaporation and win a separate potassium rich fertilizer. The energy contained in the organic part - inclusive the pulp - may also be extracted as biogas. The biogas typically powers a gas engine based Combined Heat and Power Plant (CHP) providing more or less energy self-sufficiency. The cogenerated steam and electricity powers the whole factory. This is a typical scenario for combined starch and bio-ethanol plants. More about bio-fuel. Animal Feed. The high potassium content of potato juice is an advantage in fertilizers but a draw back in animal feeds. Minor quantities may be administered to cattle and it is a good idea to include as much juice as possible in the wet pulp used for cattle feed as is. 25% of the juice is disposed of in the way. Minor quantities may even be used in pig feed, but it affects the palability and we know og no practical use as such. More about juice in pig feed. 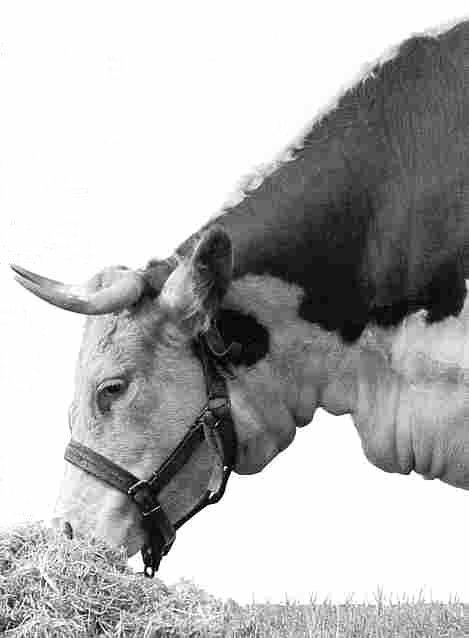 There is a long tradition for using the fiber fraction in cattle feed. Only ruminants digest cellulose and they are rather good at it. 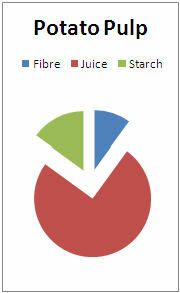 In fact the fibers is a roughage and improves milk yield in dairy farms. 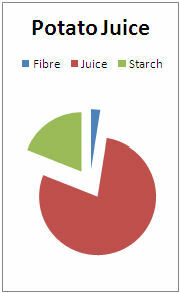 The feeding value of one kg pulp dry matter is equivalent to one kg of barley grain. In lack of nearby cattle herds a bio digester is second of choices. The energy in the pulp is turned into good use as biogas and the residual effluent and waste is of no less value as a fertilizer and should by all means be disposed of by landspreading.